Cine Cubana is a short visual tour of the forgotten fragments and decaying monuments of Cuban cinema's past. 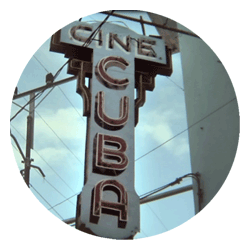 Shot on location in 2006/07 during the Havana Film Festival, Cine Cubana serves as a picture postcard travelogue of the abandoned and decaying movie houses and famous locations of Cuban cinema history. At times nostalgic and contemplative, and at other times lively and didactic, Cine Cubana reminds us not only of Cuba's rich and diverse history, but also of her vibrant and active present.